Today is the last Monday of my first session of grad school and better yet, it's my last day of field work for this short semester! I am pretty thrilled about that considering I've come to realize that being a preschool teacher is not my calling (I'll stick to kindergarten and above please). I am pretty excited for this session to finish up on Friday but know that there is a lot of work to get done in the meantime with 24 assignments (read:projects) due on Friday, blog posts to schedule, and two finals on Friday as well I can pretty much guarantee I'll be sleeping during my flight to the beach. I feel like these step into my week posts have gotten more and more boring as the summer has progressed but school in the summer time is a new concept to me and since each session is only a month long there is a whole lot to fit in. This past week was pretty much the same as other ones in June with class from 9-4, barre at some point, cooking myself dinner, and getting work done. I will be sharing some of my go-to recipes with y'all at some point but if you have any quick and easy dinner recipes definitely let me know because mine tend to lack creativity. Come Friday after field work I was exhausted so I came back and took a much needed nap before spending a few hours by the pool. 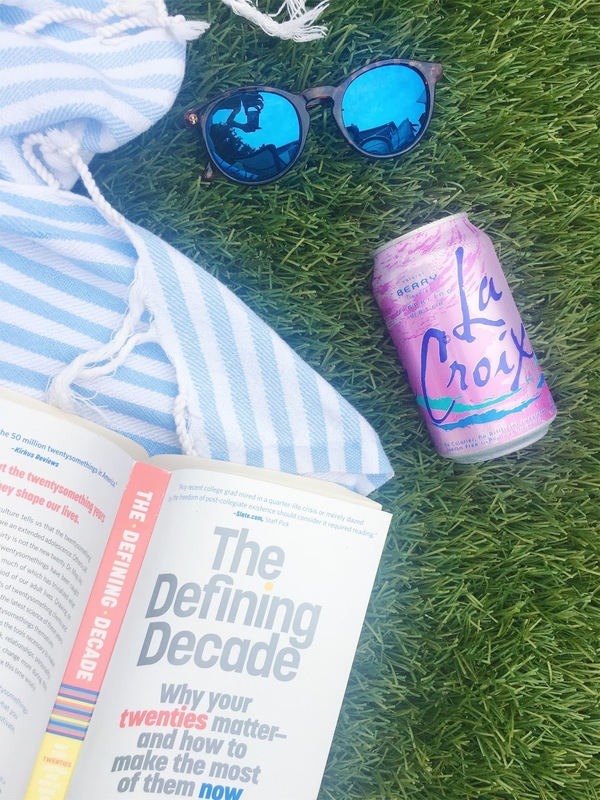 If you didn't see my instagram, I read The Defining Decade and actually finished it by the pool on Sunday. I really liked it but won't give away too many details since it may just be a Novels with Nell soon. Friday night I made dinner and did some work at Starbucks since my roommate was out of town again. As lame as it seems to do work on a Friday night it actually feels really nice having some of it accomplished so that Saturday and Sunday can be a bit more enjoyable. Saturday morning I got up and went to barre and then went to the Farmer's Market down town with Sophia. Although it was overcast there were tons of people walking around and it's always fun to explore. I didn't end up getting anything especially since I'll be out of town this weekend but will definitely be going back in the weeks to come. After that I went to Home Goods, At Home, and Target to look at various items for our apartment but all I ended up with was a shower curtain and a swiffer. I had been using just a liner so I am glad to have finally found a curtain that I liked and that fit my shower. Lastly, if you need a good laugh go follow this instagram. I ended up staying up later than I had planned last night and partially blame it! I think I'll give the book a try! Not sure if you have a Crockpot or not (if not they sell small one and I totally recommend buying one!) but I love to make spicy chicken in it. A few chicken breasts, chili powder, cumin, garlic, red pepper flakes, chipotle chili powder, a little chicken broth then you turn it on for a few hours and that's dinner! If you make extra chicken then it's dinner for a few nights or you can eat it for lunch. I'm a school-based SLP and preschool kiddos are HARD! Such a wonderful weekend! I love being productive on a Friday night. It makes me feel so much more ready to relax on Saturday and Sunday. I watched Moana on Netflix the other day and totally loved it, such a cute new Disney movie!